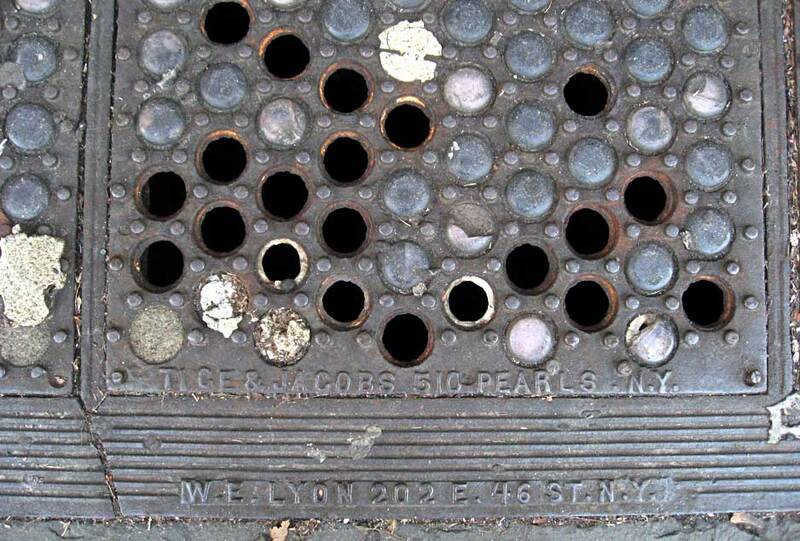 Tice & Jacobs 510 Pearl St. N.Y.
W. E. Lyon 202 E. 46 St. N. Y. These vault lights are a combination of Tice & Jacobs and W. E. Lyon, with Tice & Jacobs manufacturing the vault lights and Lyon supplying the supporting iron framework. The partners at Tice & Jacobs were George W. Tice (1849-1907) and Jacob Jacobs (1839-ca.1906/07). In the mid-1870s George W. Tice was a broker, who, with Franklin Lynch (1852-1936), founded the customs house brokerage Tice & Lynch located at 34 1/2 Pine St., New York. He seems to have teamed up with the iron worker and inventor, Jacob Jacobs, around 1880. The firm, Tice & Jacobs, "skylights," first appears in New York city directories in 1881. Beginning in 1879 Jacob Jacobs secured a multitude of U. S. patents relating to vault lights. I managed to count no less than 65, beginning with Patent No. 222,053, dated 25 Nov. 1879: "Improvement in Illuminating-Tiles for Roofs and Pavements." Jacobs' improvement in vault lights was "to so construct an illuminating-tile that the glass lenses will be protected from breakage due to expansion by placing an intervening substance between the glass and the filling (cement) which forms the walking-surface." Jacobs' description of his invention gives due homage to Thaddeus Hyatt: "The invention of a combination of glass lenses set in small apertures in strong iron plates or gratings, forming a surface suitable for being walked upon, is primarily due to Thaddeus Hyatt, as the recorded patents for illuminating-tiles duly prove; and so, too, in forming the approaches to a building from the sidewalk over an area way by means of a solid translucent bridging of iron and glass which serves the double purpose of stoop and roof, the merit of such invention not only remains with the said Thaddeus Hyatt, but he and his brother, the late Theodore Hyatt, have duly placed on record both in the United States and in Great Britain further improvements in applying cement to the surface of the illuminating iron-tiles as a preventative against slipping." For more on Thaddeus Hyatt see the T. Hyatt vault light page. The 1880 U. S. Census (non-population schedules) recorded Tice & Jacobs, Vault Lights. They owned capital worth $3000 and raw materials valued at $2000. They employed an average of 10 workers, and paid total annual wages of $2770. A skilled worker was paid $2.00 a day, and ordinary laborers were paid $1.00. The business was in operation full time 12 months in the year, and the value of the past year's product was $9000. These numbers seem rather modest. Compared, for instance, with Ingalls & Mark, manufacturing vault lights at the same time, the value of the annual product is less than half. Tice & Jacobs, founded in 1880, was in business at 510 Pearl St. from 1887 to 1907. But something seems to have gone wrong in its later years. At least, Tice's involvement (for reasons unknown) came to an early end. In 1907 George W. Tice committed suicide. The notice in the New York Times (6 Oct. 1907, p. C4) reads, "Made desperate by the prospect of poverty after years of prosperity, George W. Tice, a resident of Westfield [New Jersey], committed suicide at his home last night by inhaling gas. His body was discovered in the bathroom by his wife, and it was at first given out that heart disease was the cause of death. Mr. Tice was formerly head of the manufacturing firm of Tice & Jacobs, Water Street, New York, and his fortune at one time was estimated at $100,000. Business reverses came, and a few months ago it became necessary for Mr. Tice to get employment as a clerk. He is survived by a widow and nine children." Concurrent with the later years of Tice & Jacobs, Jacob Jacobs had his own business, Jacobs & Sons, at 510 Pearl St. from 1901 to 1908. His sons were William Benjamin Jacobs (1867-?) and Edwin J. Jacobs (1870-?). In 1908 this company changed its name to Jacobs Co. and relocated to 562 W. 34th St. Jacobs Co. went out of business in 1911. In 1899 William Jacobs secured patents for a design for a glass or light "for illuminating gratings" (U. S. Design No. 30,000, dated 10 Jan. 1899). This advertisement for Jacobs & Sons at 510 Pearl St. appeared in the catalog of an exhibition held by the Brooklyn Chapter of the American Institute of Architects in 1902. A similar advertisement for Jacobs & Sons appeared in the same group's catalog of their fifth exhibition in 1905. This advertisement appeared in Sweet's Indexed Catalogue of Building Construction for the Year 1907-08. Other examples of Tice & Jacobs vault lights are found on Willow St., in Brooklyn Heights, and East 11th St. near 5th Ave. in Manhattan. Another survives in front of the Pulitzer House (McKim, Mead & White, 1900-03) at 11 E. 73rd St. The vault lights at 190 Water St., Brooklyn, are inscribed Tice & Jacobs 67 Centre St NY. 67-71 Centre St. was an early address of the company listed in city directories from 1881 to 1888. An example of Jacobs & Sons when located at 510 Pearl St. is found on Mercer St. in Soho. The W. E. Lyon Iron Works at 202 E. 46th St. have left foundry marks on several Manhattan cast-iron shop fronts. For their history see the Lyon foundry marks page.